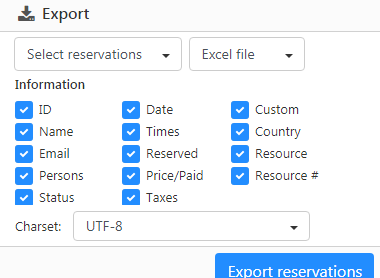 Export your reservations to use the data in other programs. It supports Excel .xls, Comma Seperated File .csv and Extensible Markup Language .XML. 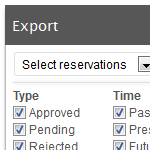 You can export the reservations from the table, all reservations or reservations selected by time and/or status. 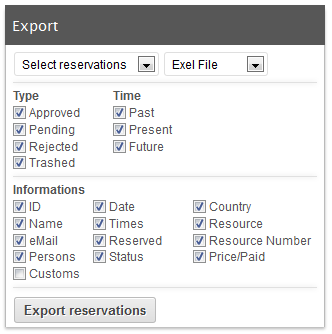 You can select to export the reservations from table, all reservations or reservations selected by time and/or status. Further you can select which information should be exported. They can be saved as Excel (.xls), comma seperated file (.csv) or .XML backup files.